The Mood Lamp is an Arduino-based project created by Italian developer Vittorio Cuculo. As the name suggests, the hacked IKEA lamp adjusts its lighting output based on the facial expression of a user. The Mood Lamp is powered by OpenCV (software) and the Arduino Duemilanove, an older board based on Atmel’s ATmega168 or ATmega328.The board is loaded with 14 digital input/output pins (of which 6 can be used as PWM outputs), 6 analog inputs, a 16 MHz crystal oscillator, a USB connection, a power jack, an ICSP header, and a reset button. Watch the video below as the lamp’s color corresponds with varying emotions — turning blue when it registers a frown, pink with a smile, blue for a ‘surprised’ expression. Interested in learning more about this project? Read Vittorio Cuculo’s entire paper here. 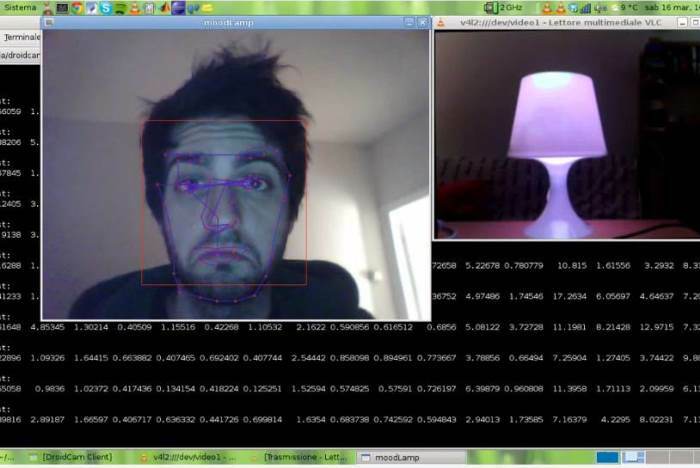 This entry was posted in Arduino, Maker Movement, Product News and tagged Arduino Duemilanove, Atmel, DIY, IKEA Hack, Maker Movement, Makers, Mood Lamp, OpenCV, Vittorio Cuculo on July 14, 2014 by The Atmel Team.